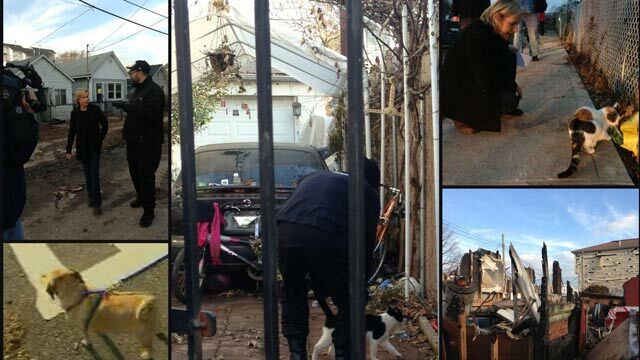 So many people have been asking what happened to all the household pets in areas hit by Superstorm Sandy. We decided to go find out. We met up with a pet rescue volunteer group based in the New York area called Guardians of Rescue. They have been working to find, feed and save dogs and cats since the day after the storm. They go door to door in washed-out neighborhoods to drop off food, pet beds, cages, blankets, even doggie sweaters. You name it! But a job this big takes lots of volunteers; Robert Misseri, who heads Guardians of Rescue, called on a friend from Detroit to help. That friend is the hip-hop artist, Hush. Hush is a rapper, but he’s also a huge animal lover. His group, Detroit Dog Rescue, has been saving starving dogs from the streets of Detroit for years. Hush believes as many as 50,000 dogs may be living on the city’s streets since so many people have fled the crumbling economy there. Hush jumped at the chance to help pets impacted by Sandy. He collected nearly 8,000 pounds of dog and cat food from his Detroit contacts and drove 12 hours through the night to meet up with Robert and his group. We caught up with them in Staten Island this week. The traps they set are humane traps that don’t harm the animal. The pets they find are taken to a foster-home until their owners are located. If they are never claimed, they are adopted out. These pets, Robert says, will never be sent to the pound or put down. I was relieved to hear that. Robert thinks people underestimated how much water their home would take on so they either waited it out with their pets or left them behind thinking they could just return home for them the next day. But we saw so many homes deemed unsafe and boarded up. The group wondered, is anyone checking those homes to see if there are pets inside? That’s why it’s so important these volunteers are out there, peering in windows and through crawl spaces, saving the lives of our four-legged friends. Be sure to watch this story tonight, and if you want to help, you can donate to Guardians of Rescue and Detroit Dog Rescue. Hush , Robert & their friends have done / been doing a great job! They are angels! Hats off to Hush from all us cats!